The Notes app on your iPhone has been revamped in iOS 9. It still creates notes that you can save or send through email as before. But it’s also packed with new features such as the capability to capture maps, photos, URLs, draw with your finger (iPhone 5 and later), and easily locate photos, maps, and anything else you attach using the new Attachments Browser. 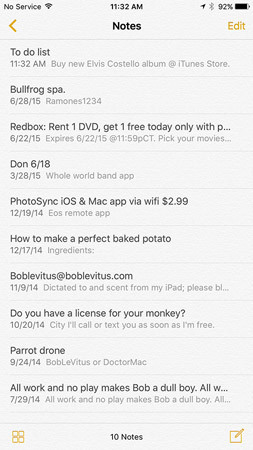 The first time you launch iOS 9’s Notes app, you’ll be given the option of upgrading to the new iCloud Notes format. If you choose to upgrade, your notes will be incompatible with other devices unless they’re running iOS 9 or OS X 10.11 (El Capitan). Choose Not Now if you need to access notes on devices running iOS 8 or earlier or OS X 10.10 (Yosemite) or earlier. You won’t get all the cool new features — maps, photos, finger drawing, and such — but you will be able to access your notes from your other devices. You can upgrade whenever you care to. Just visit Settings→iCloud and enable the switch for Notes. Let’s assume that you’ve upgraded your Notes app. First tap the Notes icon on the Home screen. If your iPhone is a 6s model, you can press the Notes icon and use the quick action to open directly to a new blank note, a new photo, or a new sketch. When the folders screen appears, tap any folder to reveal a list of its contents. This image displays a note contained in a folder named Notes; to return to the Notes folder, tap <Notes in the upper-left corner. Creating a note in Notes. You can sync notes with your computer. And if you’ve enabled note syncing for more than one account (tap Settings→Mail, Contacts, Calendars), you’ll see not only your iCloud Notes folder but also a folder for each additional account that’s syncing Notes. Tap a folder to see its list of its contents; tap the < in the upper-left corner of the screen to return to the list of folders. 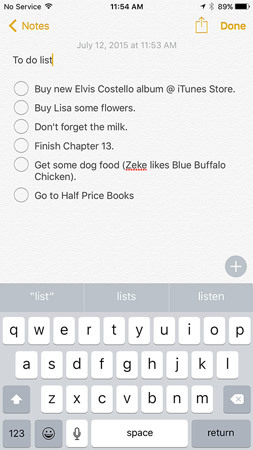 The list of notes in the Notes app. An account refers to a Microsoft Exchange, iCloud, Apple ID, Gmail, Yahoo!, AOL, or other account that offers a notes feature. Now, create a note by tapping the New button in the lower-right corner of the screen. The virtual keyboard appears. Type your note. To modify the formatting or spice up your note with a checklist, photo, video, or finger-doodle, tap the little plus-in-a-circle, above the keyboard on the right. A row of buttons appears above the keyboard — checklist, formatting, add photo or video, and finger-drawing (from left to right). To dismiss the buttons and go back to typing text, tap the X on the right side of the row of buttons. When you’re finished, tap the Done button in the top-right corner to save the note. After a note is saved, you can tap the share icon at the top-right corner of the screen to share the note via AirDrop (iPhone 5 or later); send it as an iMessage or email; post it to Facebook; save it as a PDF in iBook; copy it to the Clipboard for pasting elsewhere; or print it. To delete a note, tap the trashcan icon at the bottom of the screen. And finally, tap the Notes button, at the top-left corner of the screen, to return to the list of notes. From here, you can tap any note to open it for viewing or editing. Tap the four little squares in the lower-left corner to open Attachment Browser, which displays photos, videos, maps, and finger-drawings from every note.